Buckingham Palace, the official residence of the British sovereign since Queen Victoria and her brood took up residence in 1837, has had a rather checkered career as a Royal residence. It was so unloved at one point that it was offered to the nation as a temporary House of Parliament. But today it's one of the most iconic attractions in all of the United Kingdom. 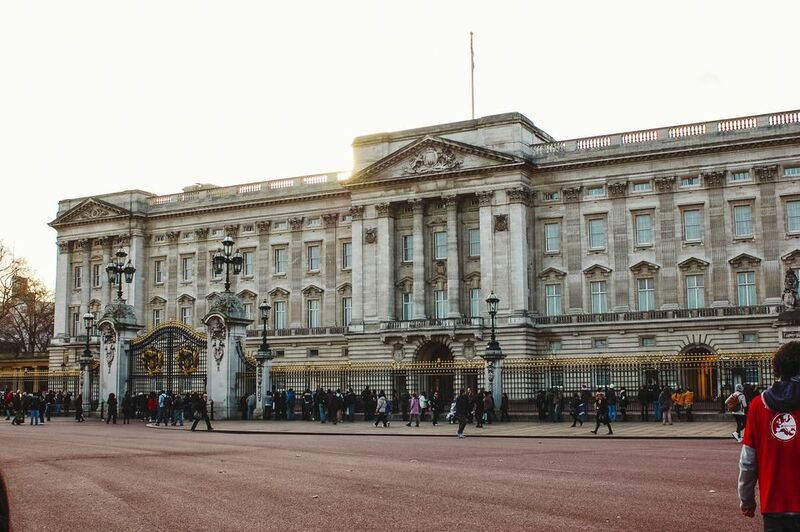 Tourist experiences at Buckingham Palace can range from a casual viewing of the Changing of the Guards to a tour of the interior of the palatial complex. In the early 17th century, during the reign of King James 1, son of Mary Queen of Scots, the land where Buckingham Palace and the Palace Garden now stands was a mulberry plantation for one of many doomed attempts to rear silkworms in Europe. The land, now between Green Park and St. James's Park, already had a house on it when it was given to a nobleman in 1628. For the next 70 years, it passed from one noble resident to another until given to the Duke of Buckingham. He built a new house on the site and it became known as Buckingham House. The original Buckingham House cost £7,000 to build. A trifle when you consider that it is undergoing a £370 million, 10-year-long "essential" refurbishment that began in 2017. The house first became a royal residence, though not an official palace, in 1762 when King George III bought it for his wife, Queen Charlotte, and children. Renovations undertaken then included fabulous ceilings designed by Scottish architect Robert Adam. When King George IV ascended to the throne, Buckingham House was still just a very big house. The king wanted a palace and employed the famous Regency court architect John Nash to give him one during the last five years of his life. Nash spent so much money (about £470,000) that as soon as the king died, the Prime Minister fired him. Various other architects had a hand in renovations but when the next monarch, George III's brother William IV, became king the house was unfurnished and unloved. William refused to move in. William had a phenomenal number of illegitimate children but no legitimate heir, so the throne was then inherited by his niece, Victoria and her considerable family. In no time at all, Buckingham House, now officially Buckingham Palace, was too small. The parade of architects continued and the Brighton Pavilion was sold to fund the addition of a new wing for £53,000. The central balcony, familiar to watchers of royal weddings, was added then. And the Triumphal Arch, designed by Nash, was moved to the northeast corner of Hyde Park where it is now known as Marble Arch. So, if behind its 19th century facade and early 20th century Portland stone cladding (George V), Buckingham Palace seems a bit of a hodgepodge, now you know why. The State Rooms of the palace have only been opened to the public since 1993, and then only during a limited period from mid July to the end of September. The public showings of "Buck House" were initially intended as a way to raise funds to repair Windsor Castle after a disastrous fire in 1992. It turned out it was so popular that the Queen continued to allow visitors every summer. Don't expect to catch a glimpse of Queen Elizabeth or member of the Royal Family on your visit, though. When the palace is open to the public she goes to one of her country residences or makes her annual visit to the Palace of Holyroodhouse in Edinburgh. And you're not likely to see much of real life at the palace. Buckingham Palace as 775 rooms, including 19 State rooms that are included in a visit. The State rooms are where the Queen and members of the Royal Family receive guests on State, ceremonial and official occasions. The rest - 52 Royal and guest bedrooms, 188 staff bedrooms, 92 offices and 78 bathrooms - is strictly off limits. The White Drawing Room - considered the most magnificent of the reception rooms. Look out for a fabulous rolltop desk and a gilded piano provided for Queen Victoria. The Throne Room - Who knew there were so many different thrones. Under a dramatic arch and canopy - designer John Nash was influenced by theater design - are the pair of Chairs of Estate used by the Queen and the Duke of Edinburgh during the Coronation in 1953. The chair was used before the Queen was anointed and crowned. Another throne, kept and displayed at Windsor Castle was used after. The room also has Queen Victoria's throne and chairs used by George VI and Queen Elizabeth the Queen Mother. Surprisingly, before 1910, furniture used in the Coronation ceremony was sold to the guests, so there are no earlier thrones here. The Picture Gallery This is where candidates about to be honored with knighthoods and other official honors wait before being invited into the ballroom for the investiture ceremony. While they're waiting, they can look at paintings from the Queen's collection, which are changed from time to time. The Ballroom The largest of the State rooms is used for state banquets and investitures. It has a musicians' gallery, complete with an organ. The most striking feature of this room is the Throne Canopy, designed by Lutyens. It is topped by a triumphal arch, with winged statues - symbolizing History and Fame - and supporting a medallion with profiles of Queen Victoria and Prince Albert. The thrones beneath it were used in the coronation of Edward VII and Queen Alexandra in 1902. This room was styled, frankly, to knock your socks off. And depending upon where you stand on such things, it will either have the desired effect or you will think it demonstrates the worst excesses of Victorian design. The jury is out on that one. After your tour of the 19 rooms, you can wander about in the gardens or have a light bite - tea and coffee, sandwiches and cakes - in the Garden Cafe. When: Buckingham Palace is open to the public from mid-July to the end of September and then for private tours on selected dates in the winter. In 2019, the Annual Summer Opening is from 9:30 a.m. to 7:30 p.m. July 20 to August 31 and to 6:30 p.m. through September 29. Where: Between Green Park and St James's Park in Central London. The Palace is located at the juncture of two processional roads - Constitution Hill, which runs from Hyde Park Corner and the Wellington Arch to the Palace and The Mall (rhymes with the name Al,) which runs from the Palace to the Admiralty Arch and Trafalgar Square. By Train: Victoria Station and Charing Cross are the nearest rail stations. Check National Rail Enquiries for times and ticket prices. ​By London Underground: The nearest London Underground Stations are Victoria, Hyde Park Corner, and St James's Park Green Park and St James's Park. Check Transport for London to plan a journey. By Bus: Bus numbers 11, 211, C1 and C10 all stop on Buckingham Palace Road, a short walk from the Palace entrance and other attractions. Victoria Coach Station, for longer distance coach arrivals, is about a ten minute walk. Prices - In 2018 for Standard Admission, Adult tickets cost £25, student or senior tickets are £22.80. Children from 5 to 17 cost and the disabled cost £14 and children under 5 are free. Family tickets for two adults and up to three children are also available. How to Buy - Tickets are sold for timed entry at intervals of 15 minutes apart. They are available on the day at the Palace but as the entry can be busy during the annual opening, visitors are advised to buy their tickets in advance - either at the Palace ticket office or online. Combination Tickets: To make the most of your visit, Royal Day Out tickets are available that can be used for three attractions. In addition to the Buckingham Palace State Rooms, this combination ticket provides entry to the Royal Mews, where the Royal carriages and horses are kept, and to the Queen's Gallery. Find out more about Royal Day Out Tickets. Practical Information The Palace website has pages of information about everything from length of visit, multi-media guides in nine different languages, handicapped and access facilities to toilets and baby changing facilities. To find out about how to cope with the practical necessities of life, best check out their Practical Information webpages. The Royal Mews claims to be "one of the finest working stables in existence." I have no way to judge that claim, but it is fun to visit. The Royal Mews is responsible for all the road transportation of the Queen and Royal Family. The includes care of the many elaborate carriages of state, the horses that pull them and also the Queen's cars. You can visit this as part of a Royal Day Out ticket (see above) or separately. The Royal Mews are open between February and November, so most of the year except for the winter holiday season. The Queen's Gallery is located alongside Buckingham Palace on Buckingham Palace RoadIt features changing works from the Royal Collection - paintings, furniture, decorative objects. In the summer of 2018, a special exhibition celebrates Splendors of the Subcontinent - art from India and the Mughal Empire. This gallery can be included on a Royal Day Out ticket - as above - or separately. The Gallery is open year round except for planned closures, listed on the website, for changing the exhibitions. Clarence House is just off the Mall and down the road from Buckingham Palace. It was built during the reign of George III for his third son, the Duke of Clarence. It was the Queen Mother's home for more than five decades and is currently the official residence of the Prince of Wales and Camilla, Duchess of Cornwall. Normally, it can be visited during the month of August. But the Clarence House will be closed to visitors all of 2019 for maintenance work. The expected re-opening date is August 2020. The official Buckingham Palace website indicates that, if you have your ticket is stamped at the end of your visit, it will be good for unlimited visits for the whole year. That is seriously misleading because Buckingham Palace is simply not open for a full year. It is open from mid-July to the end of September. If you buy a Royal Day Out ticket, the other attractions on it are open year round, but "Buck House" is not. Just be aware of that to avoid disappointment.